Abby Wambach was named one of TIME Magazine's 100 most influential people. Even with an expanded field of 24 teams for this summer’s Women’s World Cup, Abby Wambach and the U.S. team will generate most of the star power for the tournament. Even with sensational stars in Canada’s Christine Sinclair or Sweden’s Caroline Seger or France’s Eugenie Le Sommer, Abby Wambach’s presence in Canada will loom large. Even among the old-school crew of veteran stars like Marta from Brazil and Nadine Angerer from Germany and Nilla Fischer from Sweden, Abby Wambach is the backbone of women’s soccer. Abby Wambach will turn 35 at the start of the Women’s World Cup. She won’t be the oldest player for the U.S., not with captain Christie Rampone set to turn 40 and Shannon Boxx about to turn 38. But while Rampone is the only U.S. player active from the 1999 U.S. that won the World Cup, and while Boxx is a veteran that coach Jill Ellis seems to have willed back onto the roster to ensure the U.S. as a holding midfielder, it’s Wambach who towers above. As the U.S. heads to Canada to try and win their first World Cup since 1999, Wambach has graduated from symbol of American soccer, to an icon. To try and isolate the aging Wambach with limited mobility from the greatest goal scorer in the history of women’s soccer — the U.S. star who headed home the greatest goal in U.S. women’s soccer history in the 2011 Women’s World Cup semifinal to beat Brazil — would be foolish. That’s what happens when you score more goals — 178 in 239 matches — than any man or woman in soccer history. Wambach has become that rare athlete whose status and importance renders silly any discussion of her mortal wear and tear. No wonder Wambach was just named one of Time’s Most Influential 100 People. In American soccer, where pioneers like Michelle Akers, Julie Foudy, Carla Overbeck, Kristine Lilly, Mia Hamm, et al. were on a mission to show the world what great women athletes can do on the soccer field, Wambach has carried the torch with respect and a serious sense of responsibility. None other than Hamm, the star striker who was long the face of U.S. women’s soccer, penned a tribute to Wambach in the April 16th 2015 release of Time’s list. "Abby Wambach has always been fearless. Even as a rookie on the U.S. women’s national team, she would score goals that made me say, ‘Gosh, if she doesn’t win the ball, she’s probably going to get crushed.’ She never blinked. If it is what her team needed, it is what she was going to do. How can you not cheer for that?" Hamm wrote. "Team USA is poised to do amazing things at the World Cup. While I can’t predict what will happen, I know that under Abby, they will never quit." Wambach was named to the U.S. roster on April 14 by Ellis. There was never a doubt she’d be part of the team, but time and the aging process has shined a spotlight on Wambach’s limitations. To amplify her unique situation, Wambach made the decision in March to quit the New York Flash of the NWSL league she helped start in order to preserve her body for the World Cup. U.S. Soccer, which backs the league, did not blink an eye, acknowledging that Wambach is different. In the games she does play, more often now for one half or as a sub, it’s clear that she’s less comprehensively effective in leading the U.S. offensive attack. She has become more of a role player, especially on a U.S. squad that Ellis appears eager to move away from the kind of direct style of play that has so long defined and made use of the U.S. team’s greatest strengths. "Abby is less effective in the direct game (when) going over the top. She doesn’t have the legs to get in behind the defenders any more. She is symbolic of the direct game to some. She is the queen of the set pieces at her advanced age," said Anson Dorrance, the former U.S. National team coach and University of North Carolina coach who has sent more players to the national team and won more NCAA titles than any other. Pia Sundhage, the former U.S. coach now back home managing Sweden, raves about her admiration for Wambach. But when Sundhage looked ahead to Sweden’s Group D match against the U.S. on June 12, Sundhage has a plan to take away Wambach as a scoring threat. "I love Abby to death but against (Sweden center back Nilla) Fischer, there has been a problem," Sundhage said, telegraphing her intent to nullify Wambach’s specialty play on offense by having Fischer — a bruising center back in charge of Sweden’s defense — take Wambach off the ball. For women’s soccer enthusiasts who really know collegiate soccer and the new wave of players being developed in the U.S., Wambach’s continued presence at the heart of the U.S. squad is a reminder that the U.S. will always face a conundrum: Do we play with our speed and athleticism and direct style, as typified by the Wambach years, or does the national team need to adopt more ball control and play through all three lines more often? Again, Wambach seems to be at the center of this theoretical debate. More than any other woman on the 23-player roster for the U.S. World Cup squad, Wambach is a symbol as much as she is a soccer player. That role was solidified on July 10, 2011, when Wambach and the U.S. were facing elimination in the semifinals against Brazil, and, as if ordered up from the soccer gods, U.S. midfielder Megan Rapinoe blasted a perfect ball toward the goal knowing, she said, that Wambach would be there. Wambach was there. Was she ever right there, in perfect position to perform a miraculous piece of athleticism. She lept and greeted the ball with her forehead, directing a perfect header into the back of the net to even the score 2-2 and send the U.S. to the semifinal win. American fans watching the match from Dresden were in blissful shock and glee. The TV commentator shouted what everyone was thinking: "Oh, can you believe this!? Abby Wambach has saved the USA’s life in this World Cup." However, being the co-creator and the finisher of one of the most amazing goals in international soccer history was painfully compromised by the ultimate agony Wambach and the U.S. team suffered in the 2011 World Cup finals when Japan, fueled by two of their own incredible come-from-behind goals, won on penalty kicks. To this day, Wambach carries with her the strange duality of 2011. "A lot of people remember the 2011 goal we scored in the World Cup against Brazil in the very, very last seconds of the game to send it into penalty kicks and we were down a man and it was one of the most dramatic games ever. It was such an amazing moment. It was such an amazing event. People were watching and those are the moments in time when you think about how a moment like that can not only affect the game, your game, but the game in the country, the game in the world, the game on the global scale and for me, I was there at the right place at the right time,” Wambach said. But the ultimate loss in the finals still stings. "I know people think we won the World Cup in 2011 but we didn’t win the World Cup. We fell short," Wambach said. There was never a doubt that Wambach would be back. If Wambach might have ever doubted whether she would or should be part of the 2015 effort, U.S. Soccer president Sunil Gulati made damn sure that idea was off the table just hours after the devastating loss to Japan in Dresden in 2011. "Abby is a very special player and person and part of this team. She is the lead scorer in this history of women’s soccer," Gulati said. "We had a talk four years ago after the loss to Japan. We were standing together at baggage claim and we talked right there about coming back in four years to play again in the World Cup. Abby has a role on this team. There are a lot of specific situations that come up where she will be needed and Abby has been the first to say that she’ll do whatever she has to do to help her team win," Gulati said. Gulati’s commitment to Wambach is in part because of the leadership and symbolism Wambach brings to U.S. Soccer, which has funneled millions into player development and contracts to allow the women to train as professional soccer players. Likewise, Wambach’s header in 2011 helped to ensure women’s soccer was not going to go on desperate life support. 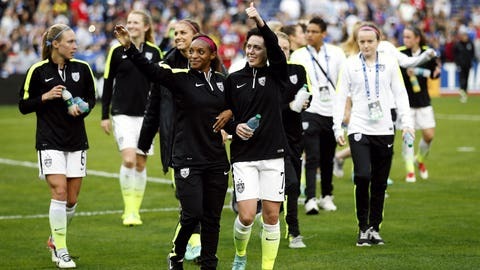 After the failure of two pro leagues that failed to capitalize on two USA Olympic gold medals in 1996 and the 1999 World Cup, U.S. Soccer was eager to find a new way to support women’s pro soccer. This time, with the NWSL, the U.S. federation along with Canada and Mexico, has committed millions more to pay for the salaries of national team players who are allocated to NWSL players. That’s why the Abby Wambach of 2015 can not be divorced from the Abby Wambach who saved the U.S. in 2011; who ensured a women’s league had a chance; who re-ignited fan appreciation across the U.S. for the women’s game. Gulati rightly calls what Wambach did "water-cooler talk" that brought people together for discussions about how Wambach’s 2011 goal was a symbol of American resiliency. Wambach earned leadership kudos for taking on FIFA with a lawsuit over the use of artificial grass for the World Cup venues in Canada. Like her predecessors Julie Foudy, Michelle Akers and other members of the women’s national team in the 1990s who went on strike over salaries and bonuses ahead of the 1996 Atlanta Olympics, Wambach has earned praise for leadership in equality for women’s soccer. Heading into the 2015 World Cup, Wambach said she wants to stick around and play in the 2016 Summer Games in Brazil. As a symbol of women’s soccer, she has earned that right and the respect of her teammates, fans and federation officials. However, given the realities of her physical limitations, maybe life after being a player will get easier to accept should the U.S. finally win the World Cup title. Maybe Wambach will be better able to imagine her next role as a coach, or international sports leader, once that World Cup score is settled. Either way, she has already earned her place in history. Icon.